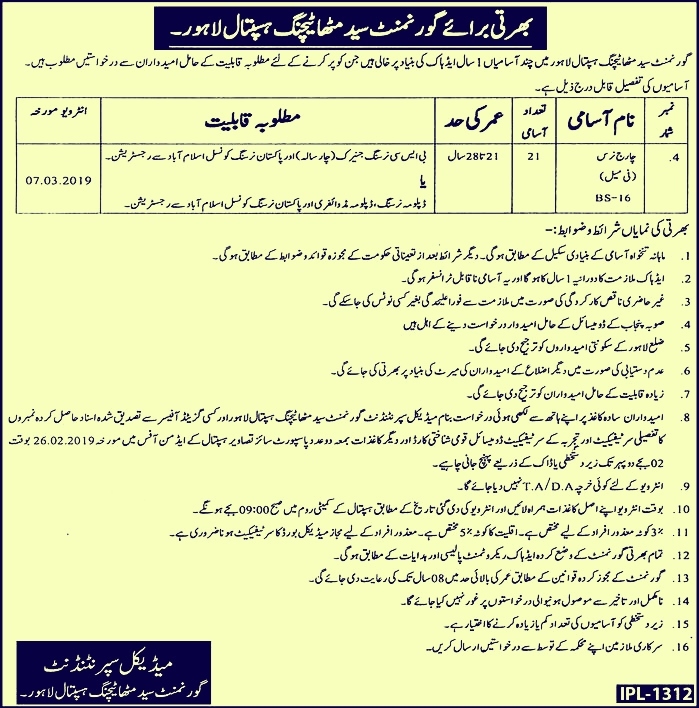 A number of jobs have been announced for the charge nurse at Govt Syed Mitha Teaching Hospital Lahore by the Punjab government. If you have a Charge Nursing Diploma, you can do this job. The monthly salary will be according to the basic scale of the vacancies. Absolute and poor performance will be separated from the job. Punjab candidates are eligible to apply. Candidates living in Lahore will be given maximum priority. Incomplete and delayed requests will not be processed. How to Apply for Govt Syed Mitha Teaching Hospital Lahore job 2019? Candidate with a hand-written application on plain paper and all attested documented certificates, Domicile, CNIC, two passport size photograph submit your request to Admin Office by February 26. 26 February 2019 is the last date to apply.